Many people nay think “fat” is unhealthy, whether it is fat loss or muscle strengthen, everyone is shunned. But the truth is that fat is actually a necessary nutrient for the human body. Ingesting the correct type and weight of fat is not only necessary for maintaining daily health, but also very helpful for muscle strengthening and fat reduction! Healthy fat, refers to a material which is from the integrated, rough processing and non-fried foods, contain a lot of nutrition that benefits for our body. The fat we should eat the most are unsaturated fat, monounsaturated fatty acids and polyunsaturated, and relatively “clean” saturated fats. These fats include omega-3 fatty acids and medium chain triglycerides. When we choose a healthy food, an important point is that we cannot eliminate the fat absolutely. omega 3 fatty acids – the good fats, monounsaturated and polyunsaturated fat is considered as a good fat. What the difference between them is the good fats can improve many conditions of our body and the general fats can only give us some unhealthy things. Before we understand what is the good fat, firstly we need to know that it has many of our body’s necessary materials. Fats accounts for 60% of the components of our brains, they are necessary for brain functions such as memory, learning ability and emotions. In addition, fat is also a cushion and insulation material for human organs and nerves, and helps the heart work properly because 60% of the heart’s energy is obtained from burning fat. Human cells use fat to build mucosa and use it to help cells stay flexible. In addition, healthy fat plays an important role in lung, eye and immune system function. Healthy fat is also important for the digestive system. Fat helps slow down digestibility, allows nutrients to be absorbed more, and provides the body with consistently stable energy. Consumption of healthy fats can also give people a longer feeling of satiety, which is beneficial for preventing excessive diet and weight loss. Polyunsaturated fats can be found in nuts and seeds such as grains, sunflower seeds, safflower oil, cottonseed and soybeans. Lowering blood pressure and triglyceride levels are two major benefits of polyunsaturated fats. Omega-3 fatty acids are a type of polyunsaturated fat and are known to be the healthiest of all fats. Can be found in salmon, trout, sardines and other fatty fish. In addition, flaxseed, linseed oil, soy, walnut and canola oil all contain Omega-3 fatty acids. The main function of Omega-3 is to reduce the incidence of cardiovascular disease and to prevent and treat liver cancer, depression and dementia. 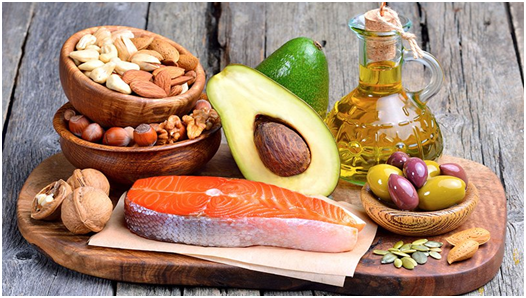 The third type of healthy fat is monounsaturated fat, which can be found in nuts such as olive oil, canola oil, peanut oil, avocado, almonds, hazelnuts and pecans. Monounsaturated fat is thought to increase high-density lipoprotein (good cholesterol) while lowering low-density lipoprotein (bad cholesterol). In addition, monounsaturated fats help lower blood pressure and promote insulin sensitivity. So the healthy fats is is too important for us, we should have a proper knowledge to it.